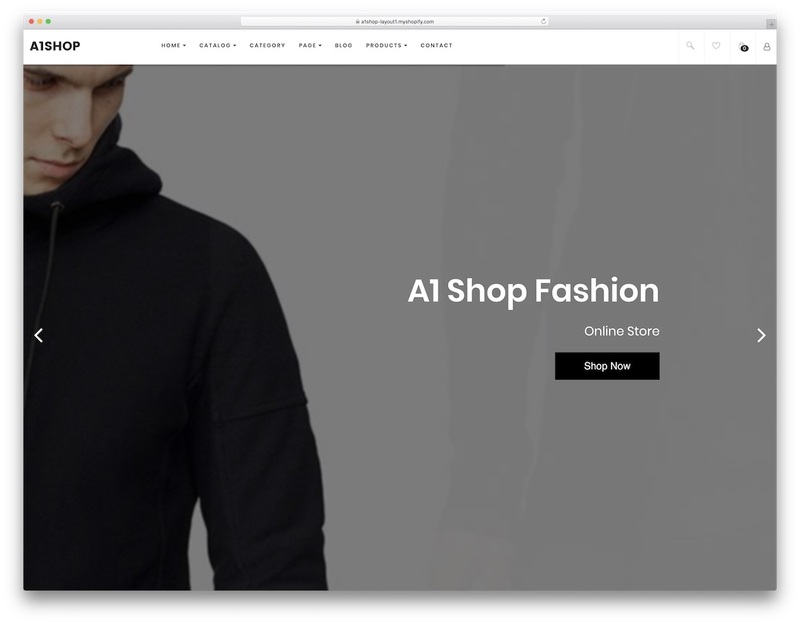 Starting an apparel, T-shirt or any other online business within the industry is simple with fashion Shopify themes. What once required a ton of time and capital, is now easily achievable with a powerful eCommerce platform and a highly customizable template. Shopify is a fabulous platform which helps you create your online dream store fast and reliable. Build a clean and minimal shop or start a complex multi store offering every single piece of clothing and accessory. Whichever path you plan to take, Shopify themes are here to help you out realize your ideas and let your project see the light. 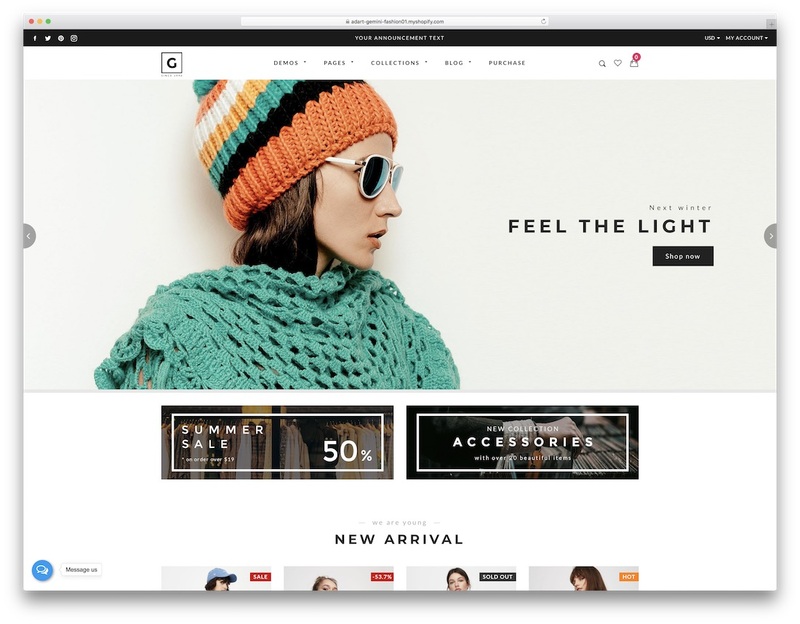 With all the available features and compatibility with many extensions, fashion Shopify themes have you covered with all and everything you need for your online business. These are one of the best themes which bring online store crafting to an entirely different level of simplicity. Meaning, either you are experienced or not, you can accomplish so much with so little work. It almost feels unfair. However, you are happy (and excited) that you stumbled across such a perfect eCommerce solution. Every theme in our collection is fully responsible, retina ready and follows all search engine optimization practices. It is cross-browser compatible, gives you the chance to modify it to its extent and ensures a wonderful user experience. From now on, nothing should be holding you back from starting a business and be in complete control of your online store. 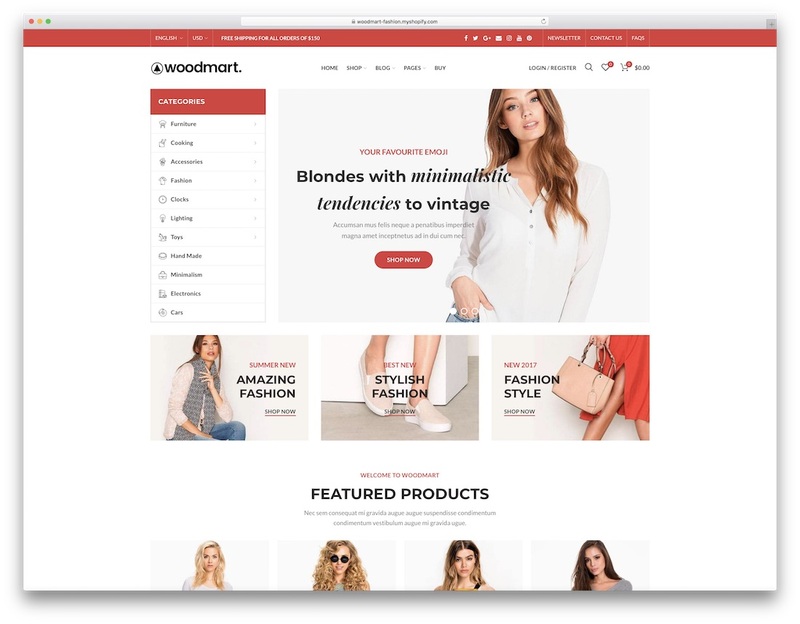 Woodmart is a responsive, cross-browser compatible, optimized and super performing Shopify theme for all sorts of eCommerce websites. It is a versatile tool which you can easily name a fashion Shopify theme. With ten predesigned demos, you will quickly find what you are looking for. When speaking about fashion and apparel, there is not one but three samples, including one for lingerie and another one for shoes. In short, you will find all that you need in the Woodmart kit. With one-click demo install, you can have the sample look for yourself in, well, one simple click. From then on, all Woodmart requires is some editing and adjusting and you are ready to roll. It is a simple to use theme which you will find a ton of joy customizing. Woodmart is also search engine optimized, WooCommerce ready, translatable and comes with helpful YouTube tutorials. Lofty is a gorgeous fashion Shopify theme that offers a minimalistic, yet features-packed, web design. It is highly versatile and adaptive, making it not only appealing for the online seller but to, which is the most crucial, end users as well. Lofty’s professional and contemporary style makes it easier to be used on any business you have in mind apart from clothing and fashion. With the ready-to-use content alone, you have a ton of options and possibilities for your web space. When you download Lofty, you receive seven solid demos, as well as many other assets. Speaking of which, Lofty features a drag and drop page builder, various mega menu styles, quick view, four unique color swatches and a ton more you can think of. In brief, with Lofty you have it all and then some awaiting you to utilize. When you decide to pursue an online career as an eCommerce entrepreneur, selling clothing and whatnot, speed things up with A1Shop fashion Shopify theme. This tool provides all the necessary for an attention-grabbing online shop where buyers will love returning to. A1Shop is also super simple and straightforward to use so anyone can hammer out the needed page and start pushing different items online. Even if you are a complete beginner with little to none prior experience. There is a ton that hits you when you unbox the A1Shop kit, starting with fifteen different homes. Wide and boxed styles with a very simplistic approach to web design so all your items are placed front and center. Other neat and useful goodies of A1Shop are video section, multi-level menu, lookbook, AJAX product filter and newsletter popup. If you want to launch an online store with ease and beauty, Minera fashion Shopify theme is the best tool to have. It is a flexible and easy going site canvas that caters not only to one specific product but to diverse items including clothing, shoes, bags, accessories and so much more. Basically, whatever you plan on selling online, Minera can help you realize it. What’s more, Minera also provides some pre-made options that even first-time users can customize comfortably. With Minera as your launching theme for your start-up eCommerce business, you receive fully integrated online selling interfaces, like quick view, shipping calculator, AJAX add to cart, product reviews and a ton more. There is no need to find another theme, not even extension, if you dig the Minera scheme. Go with it and you can have a fully functional online store ready to go live shortly after. 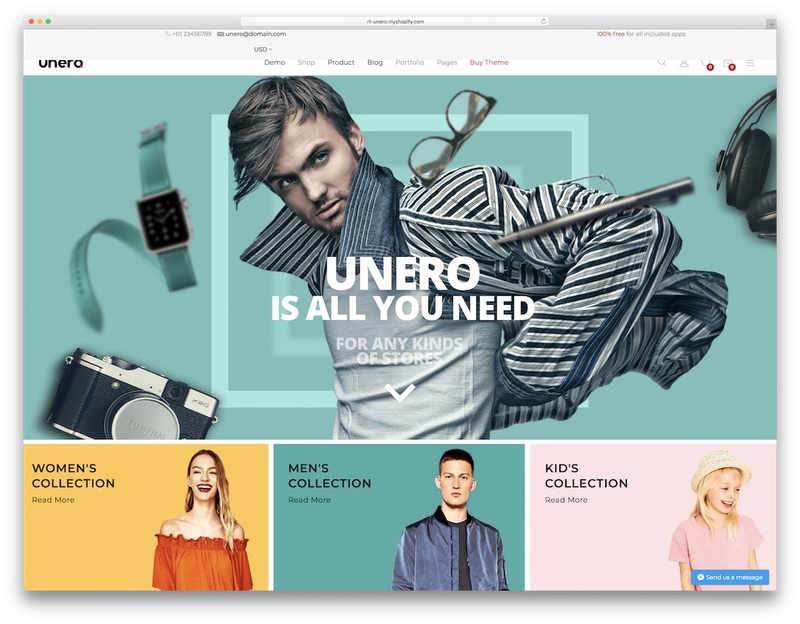 No matter if you plan to specify on a particular style of clothing or you would like to sell everything apparel-related, Nego is the fashion Shopify theme for you. It will especially suit your style if you like things minimalistic and simple. That is precisely how Nego looks. All eleven predefined demos, you get access to, are clean, stylish, elegant and appealing to the eye. And all you need to do is to install the one you fancy and start putting it to use. Nego is mobile-ready, supports all modern web browsers and retina screens. Moreover, by following all the latest trends and technologies, Nego makes sure your end product is stable and flexible to work seamlessly all the time. The package also includes a blog section which you can use to announce new drops, as well as for content marketing. HugeShop is another terrific contender in the fashion Shopify themes category. Have in mind that this is a multi-concept theme what makes it ideal for pushing all sorts of content. 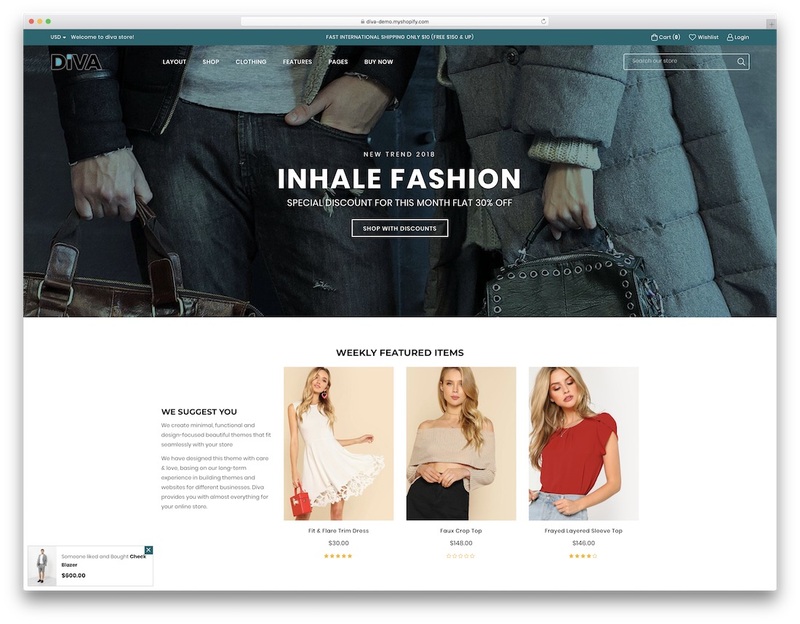 For selling clothing, HugeShop comes with a neatly crafted fashion demo that will do the magic when setting up your first or tenth eCommerce platform. With both style and professionalism, HugeShop offers you a really genuine look and feel to your online store. The material is there and ready for you to add your individual touch to it. That said, HugeShop is also very easy to manage and modify for beginners to effortlessly sell and handle all the purchases and grow their business above and beyond. But first, feel free to get HugeShop to follow all your personal preferences and make it reflect your branding to the T.
When fashion is your passion and you decide to make something more out of it, crafting an eCommerce website is a great start. 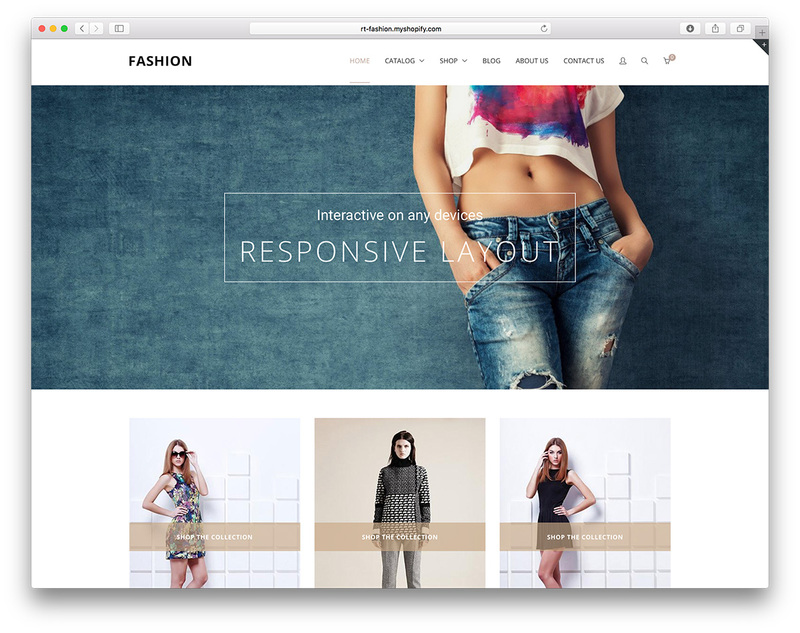 With fashion Shopify themes like Diva, you can have one up in little to no time. In the modern era, we live in, there is a ton of content pre-built for you. In other words, there is no need for you to hire someone to do it nor is it complicated to develop the entire online shop yourself. Be as creative as you would like and start pushing clothing, accessories, jewelry, bags, shoes, whatever, on the web. Diva has ten demos at your service and all other internal sections that are necessary for a web shop. Offer internet shoppers a comfortable navigation with mega menu and style the look of Diva however you want. Incorporate clients’ testimonials and gain trust and grow your business. Doing things on the web with Diva is effortless due to the fact how much it has available for you to benefit from straight away. 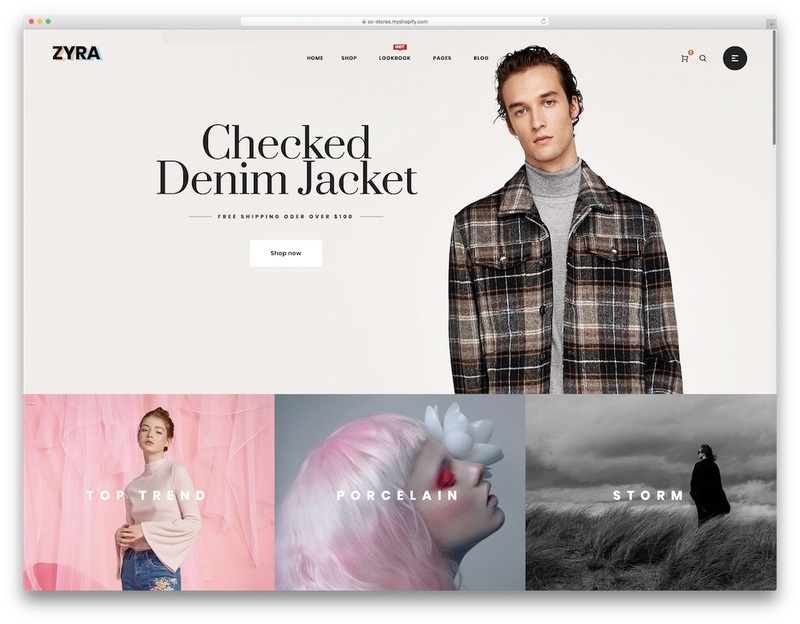 Online entrepreneurs can now download Fona and use it as their new adaptive fashion Shopify theme. It can easily improve the appearances and impact of their eCommerce websites. As one of the newly released themes, Fona offers a fully responsive layout that is based on the powerful framework, Bootstrap. Thus, giving it the capability of displaying every piece of item shared on their site beautifully and fluently on any device. Be it smartphones, tablets or desktops, Fona works on all smoothly. Along with a ton of ready-to-use content, Fona also has a lot of assets and theme options. Off-canvas sidebar, footer and header builder, product swatches, dynamic checkout buttons and a cool 360-degree view. Fona, too, comes with PSD files, complete documentation and a fast, reliable and friendly support. Get online, do things your way and stand out from the crowd with Fona. Nowadays, whatever your online business is, the website you rock must be a responsive and mobile-ready one. Otherwise, you will not get the search engine juice and your potential buyers will leave your space early. More and more purchases are happening on smartphones, even when speaking about apparel. With that in mind, choose Gecko fashion Shopify theme and start the hype. A ton of flexible and highly adaptive demos are at your disposal, practicing all the technical and web regulations. Let’s take a peek at some of the features and assets. Gecko has a collection countdown timer, age verification, catalog mode, store locator and an Instagram shop. Loads of smart theme options, one-click sample import and the practical drag and drop features, all this and a whole bunch more is what you can get your hands on by gaining access to Gecko. 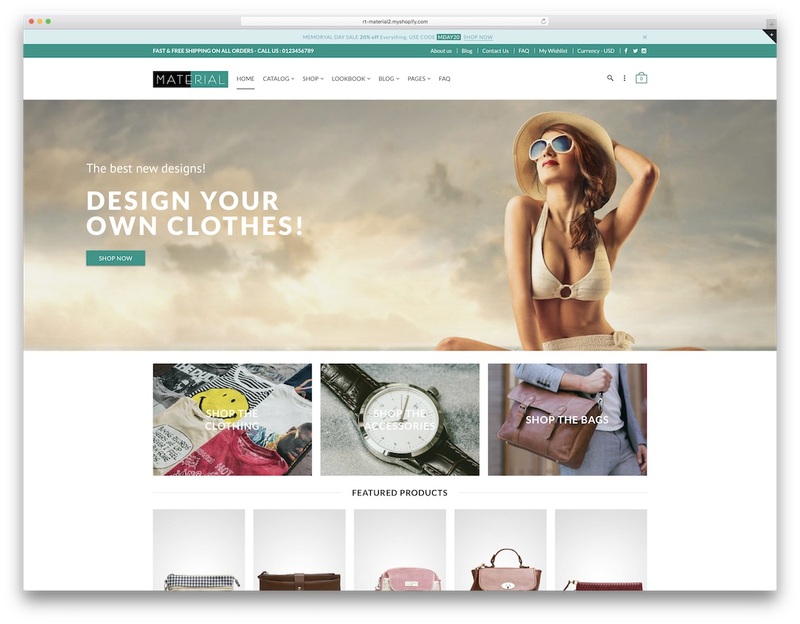 With its unlimited shop layouts and unique product pages, Zyra offers extensive functionality, practicality and beauty to its users. This specific fashion Shopify theme will make your online shop great, looking professional with minimum effort, thanks to the ease of use and navigate interface. Although a popular choice among fashion item sellers, you may also use Zyra for creating all types of other eCommerce websites. The whole fun begins by selecting one of fifteen available demos. You can then use the one you like the most as is or you can freely adjust and improve it to meet your expectations. Zyra offers a well-thought-out site navigation so your customers can quickly move through any part of your website. It is a tool well-crafted and well-developed for both the modern business owner and modern online shopper. 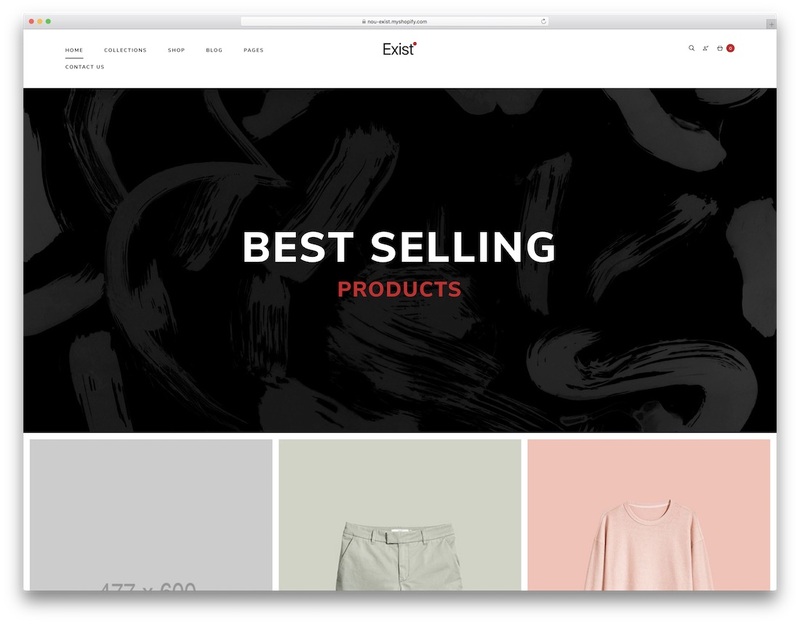 By utilizing the drag and drop function, Exist is one fine and super simple to manage fashion Shopify theme. Selling all kinds of apparel and accessories just became a whole lot easier thanks to this powerful tool. If you take action now, you can have your online shop live today and start taking first orders in a few. Nothing intimidating and complex about that, when Exist serves you all this ready-to-use content which is straightforward to edit. Twelve home variations, six shops, four portfolios, five product pages and also a blog section, that’s some of the stuff you get with Exist. Other goodies are unlimited headers and footers, hover effect, color swatches, custom logo and newsletter popup with MailChimp to name a few. Furthermore, Exist is also optimized for search engines and great loading speed. Bring your idea to reality with Exist. 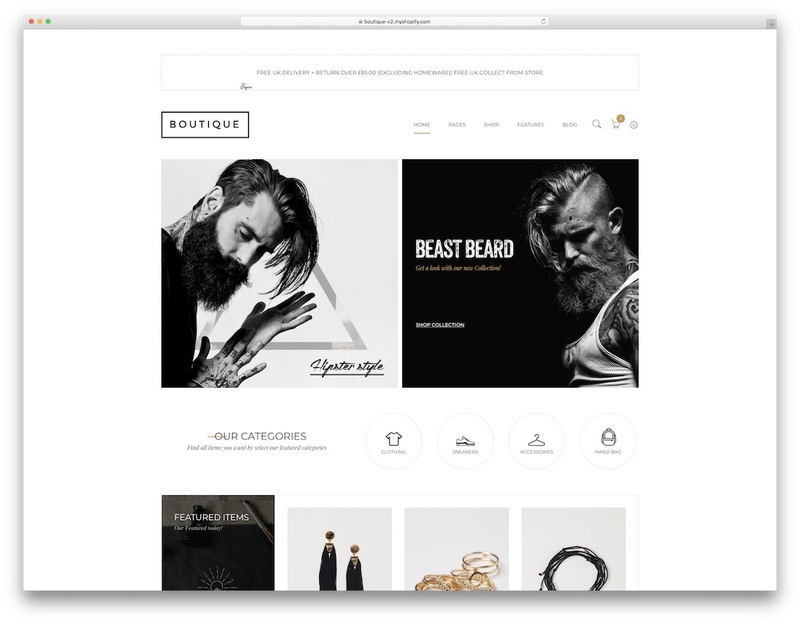 For a fully functional website that is also very easy to use and maintain, Boutique is the fashion Shopify theme you should consider. No matter if you are an experienced business owner or a first timer, Boutique will make your online store building more convenient than ever. Boutique gives you access to unlimited layouts and colors including stunning home pages that will surely boost your site’s appeal and navigability. While fashion item sellers are the main target of Boutique, others offering unique products are welcome to use the tool, too. There are twenty demos at your fingertips, each original and one-of-a-kind in its own way. Equipped with all the necessary and a lot of additional assets, with Boutique, you are set to march to create a thriving online boutique store. Get things done today and see first results coming in short to no time. Regardless of the products you would like to put up for sale, BeoShop is the fashion Shopify theme that will do you well. After all, you do not have to craft anything from scratch anymore. Just like BeoShop, all other themes in this collection of solid site skins have the demo content available and ready for you to employ immediately. It all comes down to your personal preferences concerning the web design. Other than that, all tools are superb and out of this world. BeoShop rocks a neat, tidy and professional look along with the practical drag and drop page builder and numerous built-in shortcodes. With over one hundred layout options, you have more than enough variations to find the right scheme to sell your products. BeoShop supports videos in a gallery, has a footer stuffed with widgets and makes modifying it child’s play. Do not let the name fool you, for this particular fashion Shopify theme you can use any month of the year. APRIL offers unique and cutting-edge designs to complement not just your fashion-related items, but also other desirable products you want to sell online. APRIL is an all-around tool that will meet many users’ needs and regulations. With twenty and counting different shop looks, APRIL serves even the pickiest ones. Apart from being fully responsive and fluid, APRIL is also retina ready and supports up-to-date SEO practices. With all its available features and compatibility with many extensions and browsers, APRIL is everything you need for your online business. No need to waste any more time, get busy right now and start something fresh and novel on the interweb with the powerful APRIL. 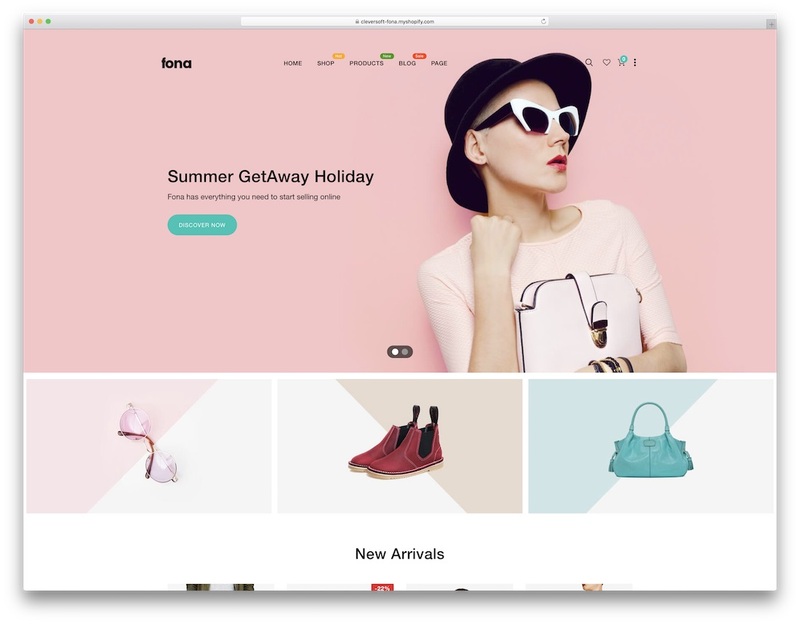 Banita is all you need when it comes to choosing the right fashion Shopify theme for your excellent products. Whether you are a reseller or pushing your own items, again, Banita is your best best. It is trendy, stylish and professional, exactly what you are after. But it is not all about the pretty looks why you will enjoy Banita so much. 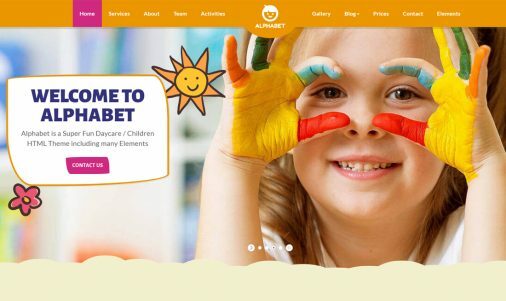 It is about the mixture of web design, features and usability why Banita rocks the web. 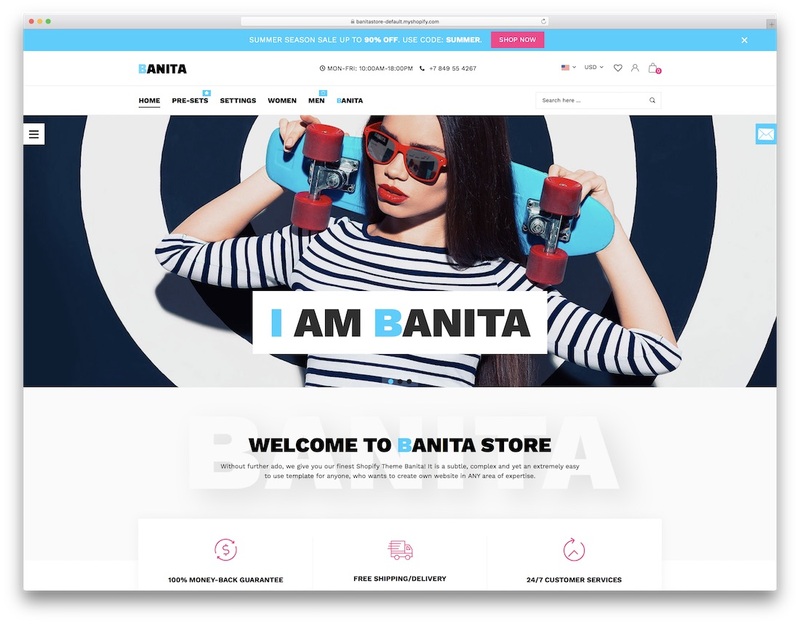 Loads of demos, handy page and sections builder, over fifty widgets, interactive slider and full RTL support, this is just the beginning of the amazing Banita theme. Social sharing, countdown timer, item status, mega menu, you name it, the list of assets Banita sports goes on and on. You only need to refine the look to suit you best and you are done instantly. It is an easy task developing an eCommerce website with a tool like Banita. Sophie is another sophisticated fashion Shopify theme dedicated mainly to the industry but not 100% limited. Meaning, you can use Sophie for all sorts of different intentions. Sophie is highly flexible and adaptable so you can easily convert it from just a store into a diverse eCommerce website dedicated to unique and even non-fashion related items. To achieve the outcome you want for yourself and your business, Sophie requires little work and effort put into the making. Due to its swift and simple customization options, users can comfortably adjust different theme elements to fit their preferences. Besides, with Sophie, users also receive features like mega menu, daily deal module, pre-made layouts, advanced typography options and a ton more. 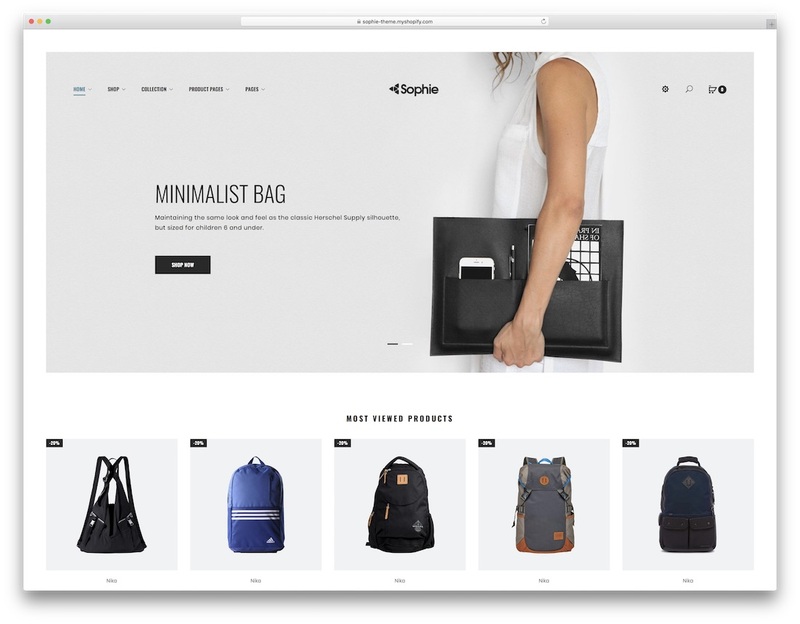 With Sophie, you can stop postponing the creation of your e-store once and for all. 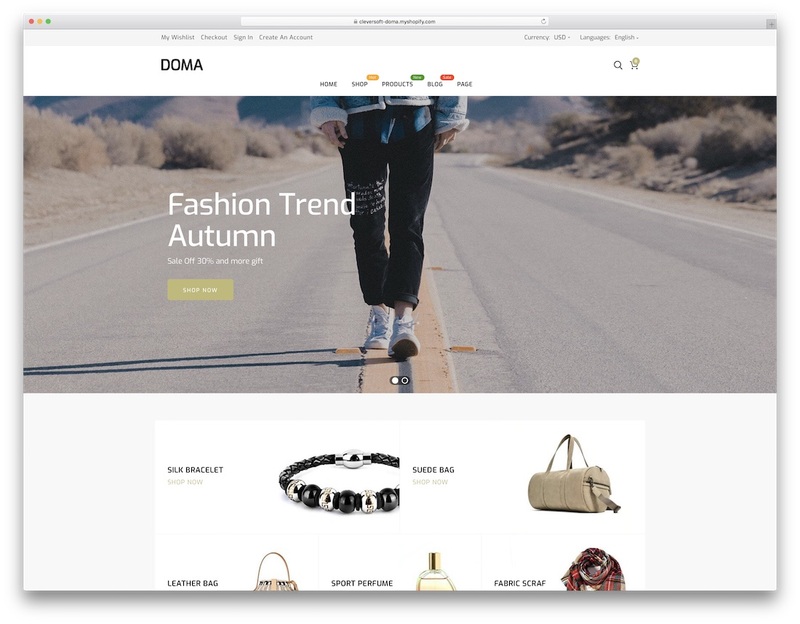 It is said that Doma is the ultimate Shopify theme due to its insane performance and fantastic customization features. 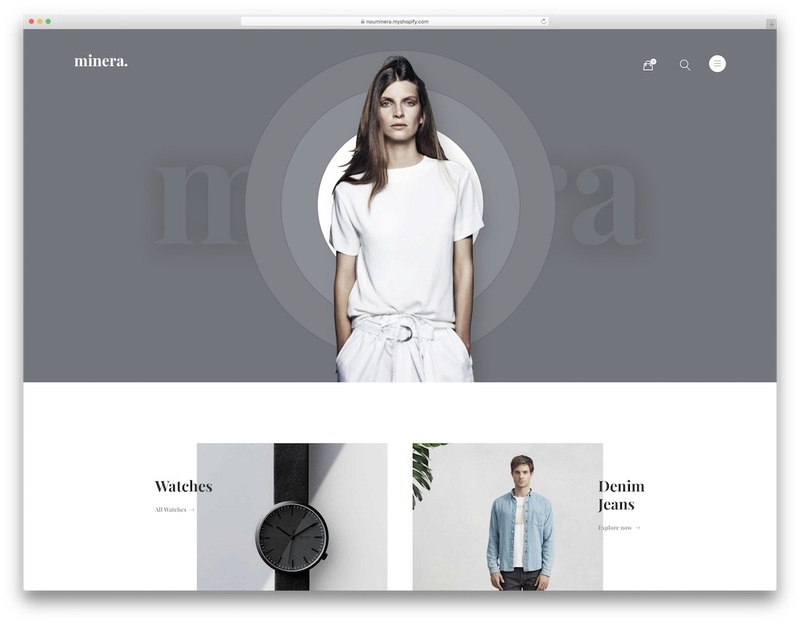 Not only that, Doma is also a fashion Shopify theme due to the pre-made content it comes with that is ideal for the purpose. Speaking of demos, there are eleven at your service including more variations coming your way with future theme updates. With such a supreme tool, you can always follow the latest trends and keep it fresh for years to come. With Doma, you have unlimited layout options. Thanks to the convenient builder, you should not limit yourself in any way. The possibilities Doma treats you to are endless. Use your creative touch and enrich the theme to suit you best. On top of that, whatever you do with Doma, the end product will appear beautifully on all devices, be it mobile or desktop. Doma makes sure your users can access your page on the go, too. 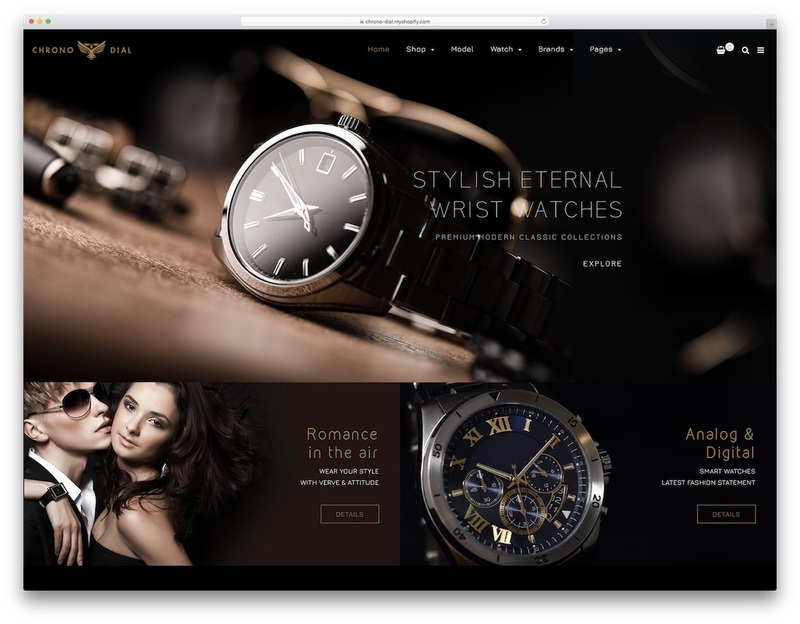 Intended for people who deal professionally with timepieces, Chrono Dial is a sleek and contemporary fashion Shopify theme. Whether you would like to redesign your current eCommerce website or start something new, Chrono Dial is always ready for the challenge. Chrono Dial is one of the finest looking tools best for launching a web space for selling watches and accessories. It has a unique and responsive web design with five different styles of mega menu. It increases your website’s aesthetic appeal and provides simplified site navigation. Chrono Dial is not just your random theme. It is fully equipped with all the required and then some to help you create the exact watch store you want. What’s more, it leaves you with enough room to modify it however you fancy. That said, there is no need for you to hold back. Go all it instead and hammer out the online shop you want. With a name like that, you know you can use this next item for all sorts of things. Variety is a multi-purpose Shopify theme for fashion, accessories, shoes, bags and all the rest you can think of. There is no need to stick only to one style of product, Variety manages them all without a hitch. Select one of four home layouts and incorporate all other internal pages and parts you need to complete creating your eCommerce page swiftly. Variety does not require you to do anything from scratch. And in case a particular section does not suit you ideally you can improve it or even avoid using it altogether. Full-width slider, image zoom, product quick view, touch friendly and compatible with devices and web browsers, Variety delivers all the mandatory and a whole lot more. With TOMO, you can make buzz online among eCommerce businesses and apparel industry. 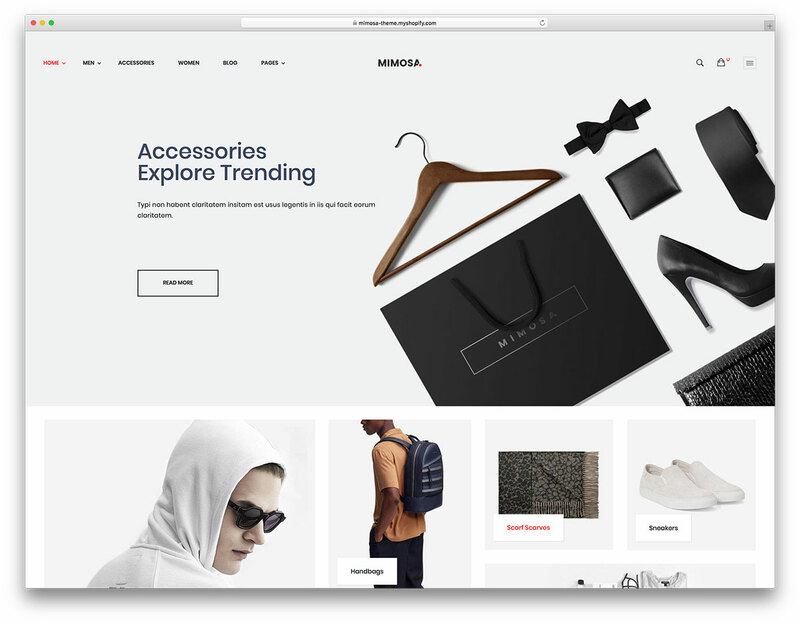 TOMO is a nifty fashion Shopify theme with a modern and fresh look, optimized for performance and packed with valuable customization options. It is also fully SEO compatible to help you increase your reach and visibility. TOMO is mobile-ready, too, and ensures super fast loading which comes extremely helpful especially for mobile device users. TOMO has seven smooth and retina ready demos to start establishing your online fashion store in a breeze. Along with all the demo material, TOMO’s drag and drop layout builder function allows you to edit and enhance the look to suit your needs best. Choose the ideal header, give them a chance to quickly check an item without leaving the current page and increase the hype by implementing an Instagram shop. Little do you know, you have your page live, attracting new potential customers. You will undoubtedly enjoy every bit of Gemini. It is not only a fashion Shopify theme but a tool dedicated for selling products online in general. However, since fashion is our topic today, we will consider Gemini a tool dedicated to the industry. Gemini gives you all the right to use it however your heart desires. While the demo content is there, ready for immediate use, you can still customize it and fill it with your individual touch. Gemini has five headers, a drop-down cart option, different grid styles, over fifteen product page layout options and accordion blocks. There’s more. Other noteworthy assets of Gemini are drag and drop sections, wishlist, newsletter pop-up and unlimited color options. Gemini also supports multiple currencies to make shopping feel more genuine and has an integrated Instagram feed. 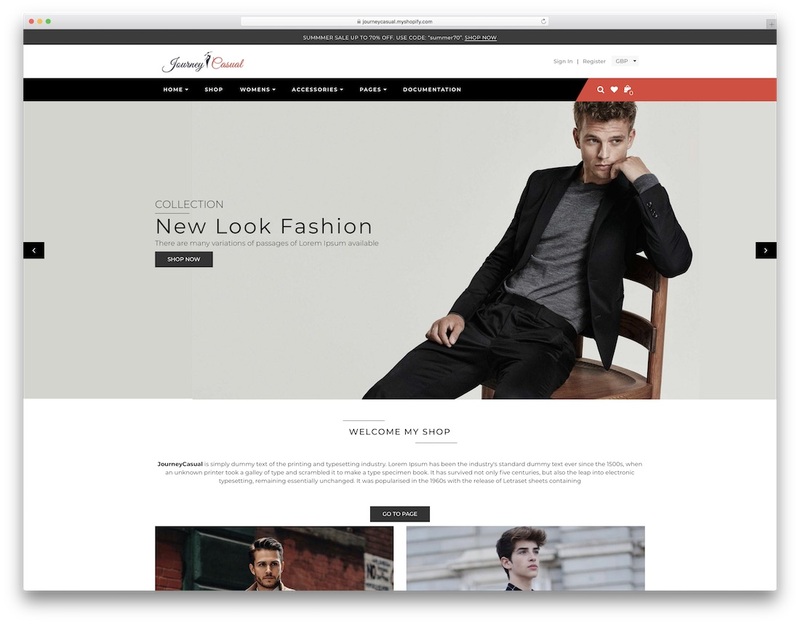 As a multipurpose fashion Shopify theme, Journey Casual attracts many users from different creative fields. Despite being advertised as a fashion intended tool, you may also utilize Journey Casual to push other products on the web but that is something we might talk about some other time. Journey Casual is a drag and drop theme that provides both functionality and good looks. It sure is appealing to the eye, creating a strong first impression for an increased chance to win visitors over. With Journey Casual’s easy to use and navigate interface, launching an online shop has never been easier. Even when it comes to newbies, they will find Journey Casual convenient and uncomplicated to work with. Similarly, it is also packed with features such as multi-level menu, six home pages, quick install and autocomplete search. That’s that, now it is time for you to take action and have an online selling machine up as fast as possible. There is no need for you to look elsewhere when you start further investigating Unero. 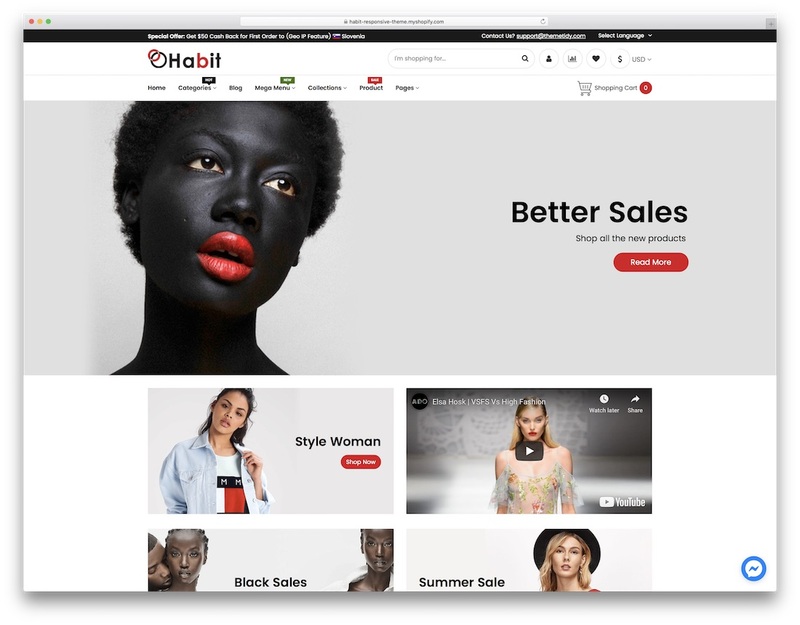 This remarkable fashion Shopify theme will have you hooked the moment you start experiencing any of the predesign demos. Speaking of which, Unero has sixteen available and more dropping in the near future. That is just enough to help you find the right look that you want to sport with your eCommerce page. It does not stop here. The excitement continues with ten shop styles, unique portfolios, blog and a large group of features and assets. Still, the hype is not over yet. While you pick the right sample material for your online fashion shop, move on with adjusting it to suit your needs and branding to the very last detail. Unero is here to treat you and your customers right so make sure you use it to its full potential and bring your idea to a new degree. For a fashion Shopify theme that is packed with practicality, style and elegance, StyleShop is the best choice you have. 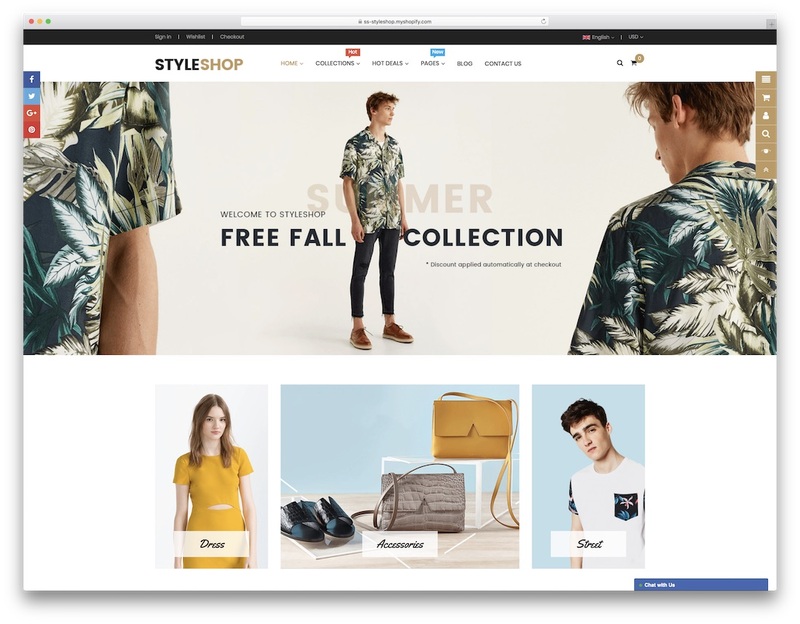 As one of the leading tools, StyleShop provides new features and improvements all the time for a constantly fresh web design that will stand the test of time. 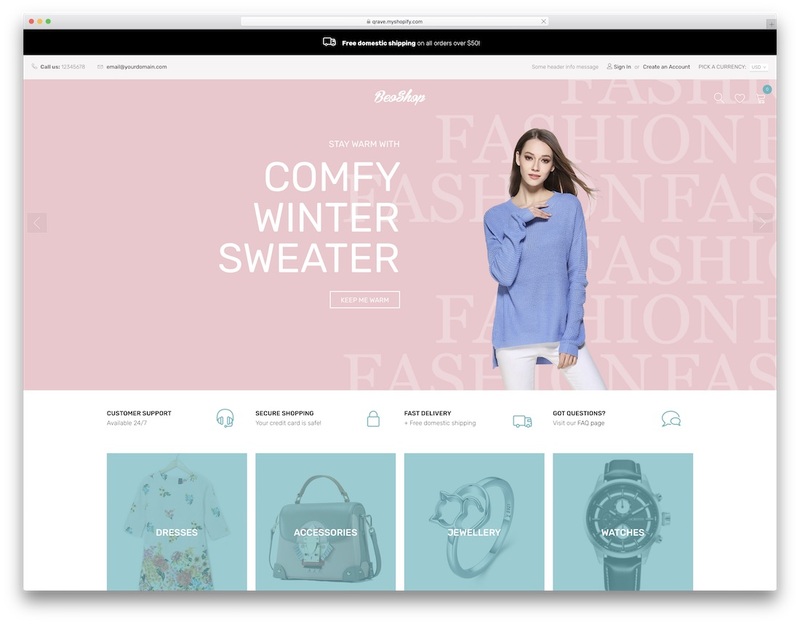 Since it perfectly combines various theme options and stunning designs, users may expect increased aesthetic appeal and functionality when working with StyleShop. 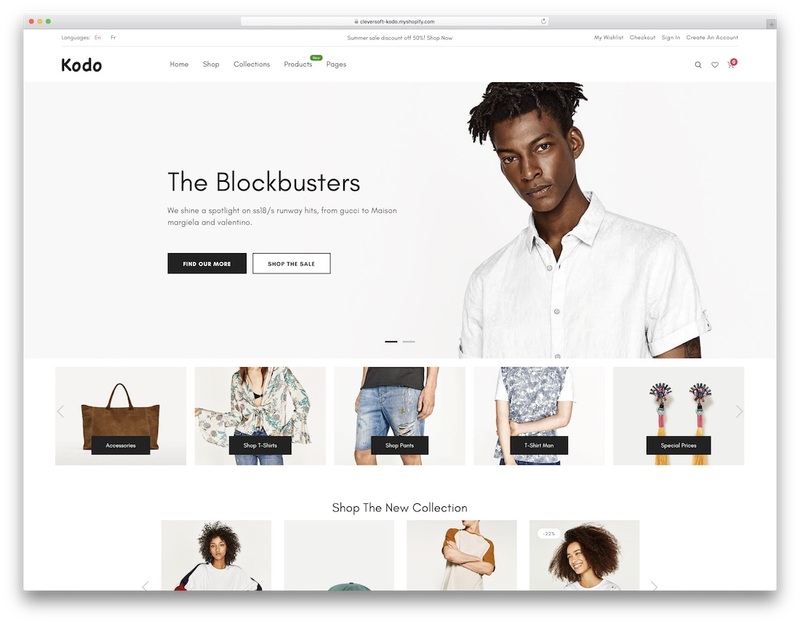 Some of the features StyleShop offers include but are not limited to three homes, AJAX layered navigation, live search, multiple currencies, hover effect for product images and grid or list view. StyleShop is also optimized for search engines, fully responsive and in tune with all the major web browsers. Once you get your hands on StyleShop, you will quickly style your ideal fashion shop, put it up and start taking fresh orders. Minimalism and simplicity are two main characteristics of Kodo fashion Shopify theme. Every time you find yourself lost, not knowing what’s the right approach to web design, just stick to a clean and smooth approach with as little distractions as possible. This is exactly what you get with Kodo. 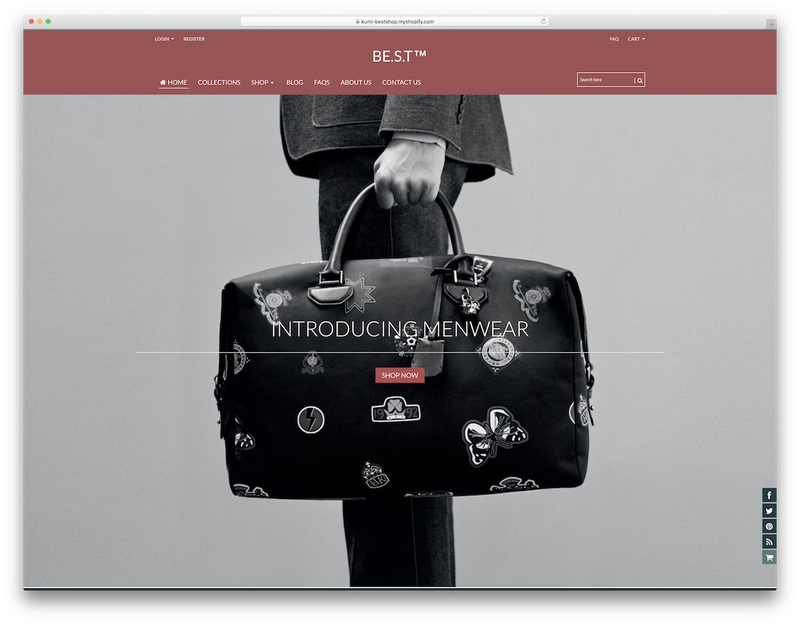 A professional, elegant, trendy and modern tool for building neat and chic web stores. Kodo is optimized for super fast loading speed to deliver the greatest performance of all times. Due to its mobile-ready layout, every device user will get to experience your eCommerce website in the same amazing way. With seventeen front page demos and numerous internal pages, you can have a completely functional site all set up in close to no time. Kodo brings forth all the features and assets you call for. To name a few, infinity scroll effect, one-click demo importer, unlimited product page and header layouts, quick view and off-canvas shopping cart are those you get access to. Get busy with Kodo today. Mimosa is a high-quality Shopify theme dedicated to accessories, fashion and furniture. Everyone with a store that intends to sell a lifestyle will be pleased by it. 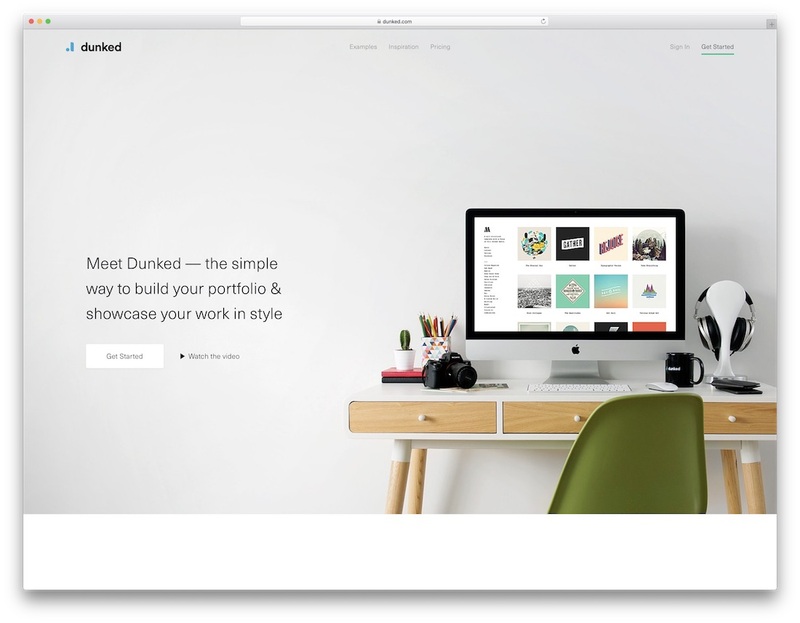 Try it out with a one-click demo import and 6 homepages to get creative! Mimosa uses a MegaMenu that allows you to display categories beautifully. It offers blogs modules, multiple sliders for products, ads and store sections. Set up a banner, play with Font Awesome Icons or just arrange unlimited multicolor layouts! Mimosa is responsive and cross-browser compatible, so clients can reach you anywhere. No matter what device or screen, graphics will look amazing especially product preview. PSD files and CSS customizations will be included. Mimosa has an aesthetic look with tons elements to play with. Design includes premium quality Google Fonts and Google Rich Snippets. Navigation is obviously one of its best trades. Don’t hesitate on creativity aspects… Customizations are at its best. Mimosa is focused on selling, and thus you will get multiple currency configurations. Add wish lists, carts, and all elements and Ajax. Start out using its intuitive video tutorials and ticket support system! Don’t miss out on this opportunity! Make your store and business the best out there with Mimosa! Establish and grow your brand with Habit. This fashion Shopify theme has a modern and clean design, imbued with the latest technology which lets you drag and drop sections instead of manually inputting them. No need to be an expert at coding and programming when Habit does most of the work for you. You will execute the entire process of building the dopest online store quickly and effectively. This modest, minimalistic theme is very easy to use, perfect for both beginners and experts in web design. Choose from hundreds of design elements that you will certainly love. All files are well-documented and commented. Other core features include multilingual support, drop-down mini cart, Facebook chat, barcode generator and blog to name a few. Habit is SEO and loading speed ready as well to ensure spectacular performance and experience. Expect a warm welcome from the support team, willing to help you with your concerns, too. 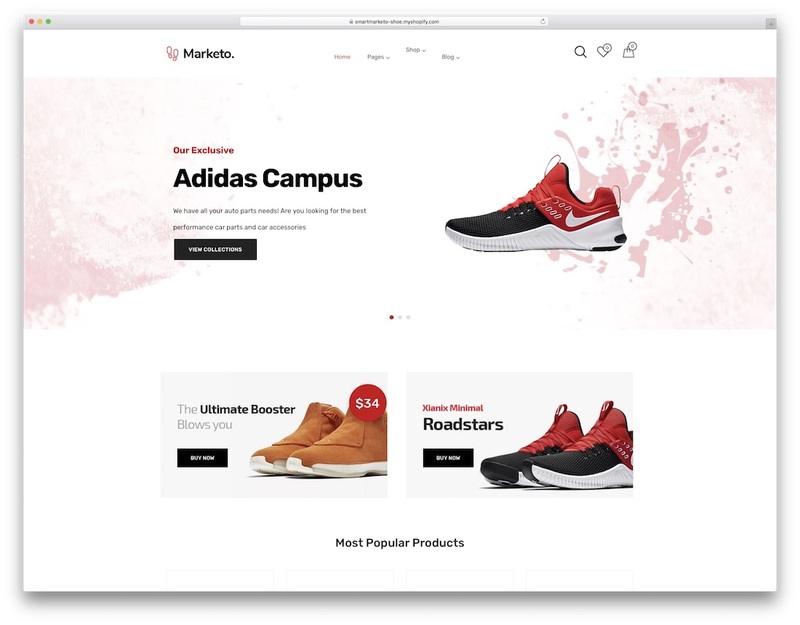 When starting up an apparel marketplace, users consider Martify as one of the best tools currently available. This fashion Shopify theme knows how to wow clients and visitors with aesthetically pleasing designs. You may think it takes a great amount of talent to build a website, but that’s not the case, thanks to Martify’s powerful technology. Adjust your page to offer the best user experience on all platforms. You can modify the entire layout or focus only on fine-tuning details, like images, icons and fonts, to your liking. 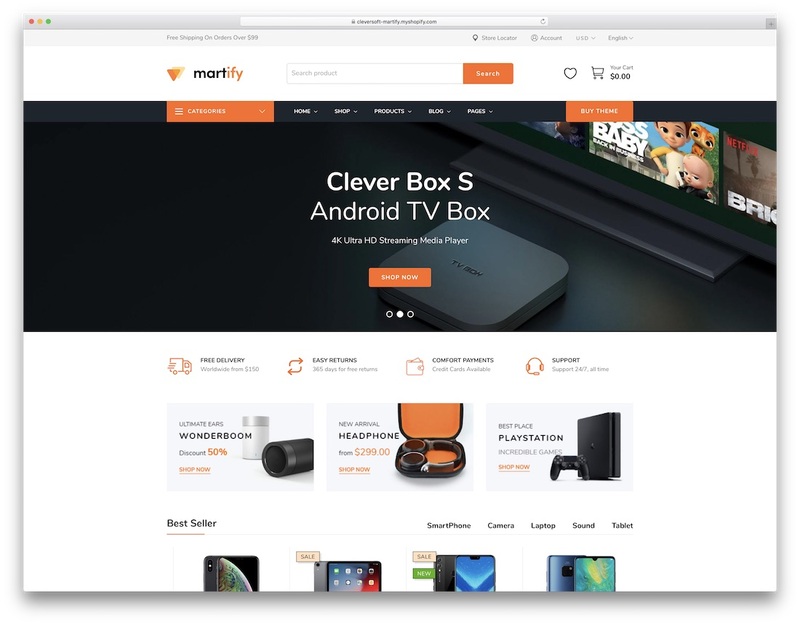 Multiple demos, unlimited header and footer options, mega menu, instant search and gorgeous quick view are just some of the goodies of the astonishing Martify. The journey to establishing the exact eCommerce website you want will be a pleasant one with Martify. It is important to know that all it takes is some dragging and dropping – NO CODING! Find a website companion that has the total package to help you craft a dream online store. Only Marketo can serve as your foremost tool to guarantee the success of your eCommerce site. This fashion Shopify theme has modern and elegant pages, all of which possess fascinating appeal. Sophistication meets functionality as this tool allows you to work with premium core functions without sweating. These include the following: SEO tools, header and footer variations, twelve home pages and preset color skins. Partnering with Marketo opens a whole lot of possibilities as you can effortlessly and quickly hammer out an online selling machine and highlight your must-own items among the crowd. With Marketo, you will manage and maintain your online fashion store like a pro from the very beginning. Even if you are interested in starting a niche store, you can do it, too, with Marketo. What is Shopy? The newest Shopify creation! A great new theme and tool built specifically for a shopping oriented business. It is made for all those who want to expand their business to the internet consumers. Shopy is Bootstrap based and provides tons of layout variations. It is flexible, easy going, and provides tons of pre-built options to customize style. It has multiple headers and a horizontal MegaMenu to play with! Shopy is UX providing special carts, views for product and location services for physical stores. To have a better contact with clients, you get a newsletter sign up system and social media included. It is widget ready and even supports a blog! 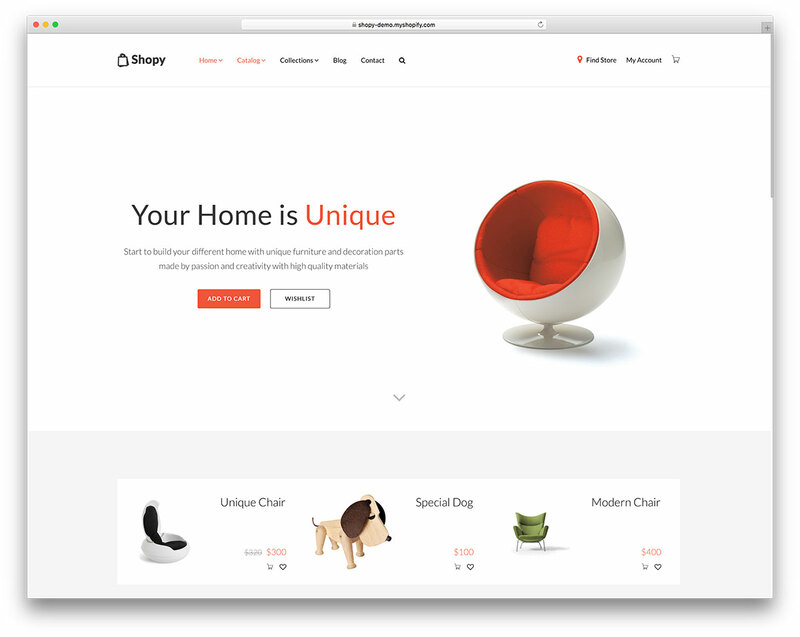 Shopy will give you many great listing pages and customizable color schemes. Special add-ons include a premium quality plugin for galleries called Slider Revolution! Image quality is at its best with retina ready design and 100% responsiveness. It adapts to all screens and browsers without a hassle. Get Shopy for speed and comfort as well! It has been optimized with SEO and features Ajax lazy loading improvement. This is a great tool meant all industries that need to allure clients with creativity and constant marketing. Get Shopy now! It is the kind of a name for a product that you know it will be fine and stylish, especially when it comes to web design. As far as Ella Shopify fashion store goes, it is all the mentioned and much more. It blends together your colors, images and blocks beautifully, allows visitors to have a flawless experience browsing through the available apparel. The large slider above the fold will grab shoppers’ attention right away and get them interested. This is the perfect place to promote new products and hot store offers. For the best site navigation and giving costumers a chance to find the desired products as fast as possible, take advantage of the Advanced Mega Menu module. Along with it, there is also Ajax layered navigation to filter the products by different tags further. Save people’s time and help them find what they want quickly and the sales will go up. You can showcase your amazing products in a grid or a list mode and customize category page by the number of rows and products per page. A quick product view is also available for a sneak peek without leaving the current page. Also feel free to add testimonials and build trust through a stunning blog section. A quick online eCommerce business launch is super possible with Quickshop fashion Shopify theme. This drag and drop responsive theme is an all-in-one perfect tool for building a wide variety of online stores. Your shop will look amazing on all screen sizes and all devices. Due to its simple customization options, you can adjust different elements to your needs and requirements. You can also use this theme for the creation of stores outside the fashion industry. 4 beautiful skins are available for you to use and speed up the method of crafting your website to its perfection. You might expect new variations to drop in the future, too. For showcasing products in the best possible way, you can use custom image sizes and save shoppers time with the quick shop option. It displays images and item info in a clean popup, so they do not have to leave the current page. Quickshop is built on Bootstrap Framework what ensures the optimization and adaptability of the theme. It supports Google Maps, multi-currencies, is translatable and helps you grab visitors’ emails with MailChimp’s pop-up. You also need to take into consideration all the social sharing options. These can quickly grow your business. If the experience and the products is what users love, they will be happy to help you spread the words and share it on their social media. 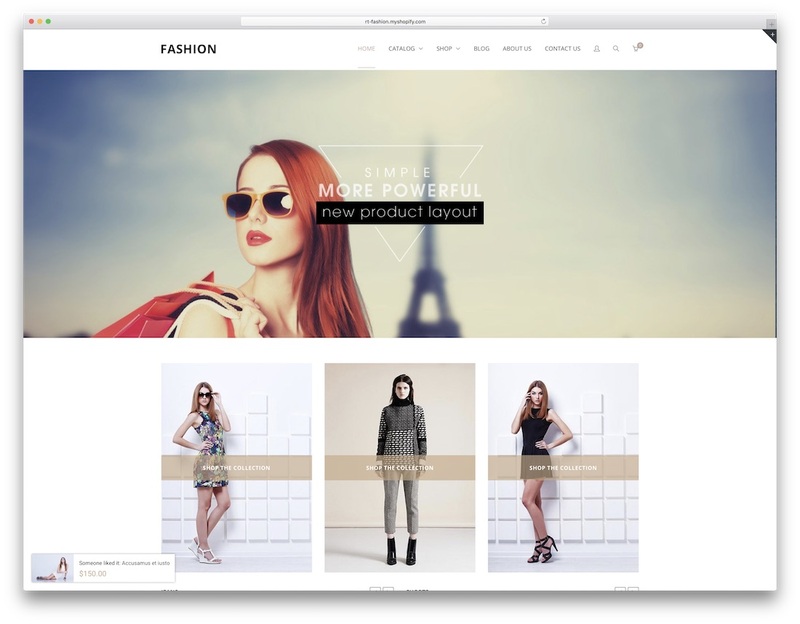 You almost get an intimidating amount of features with Belle fashion Shopify theme. But that is a good and positive thing, right? You bet! While the name of the template perfectly fits a female clothing store, you can construct any type of shop with Belle. 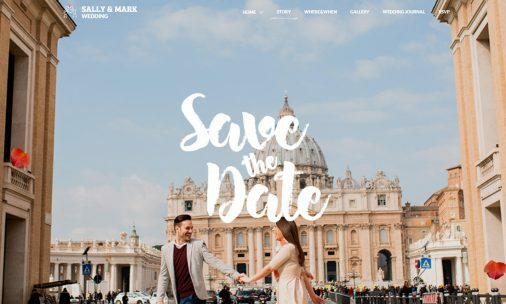 Let it be male, female or a mix, kids, accessories or jewelry, Belle has everything you need for completing putting together a pleasant and attractive web design for your store. The useful information blocks are placed strategically so visitors can quickly find the information they need. An overall shopping experience will be enjoyable for mobile phone, tablet and desktop users. The responsive design, fast loading speeds and elegant layout do magical things for the best time spent on the site. Belle treats you with 4 different ready-to-use layouts which you can use right after the installation. Or, if you like to invest more time into it, have these only as a guide what is possible with Belle. Another option is that you improve the existing layout and add your personal touch to it so it still stands out from the crowd. Do what feels right, and Belle will bring it into being. 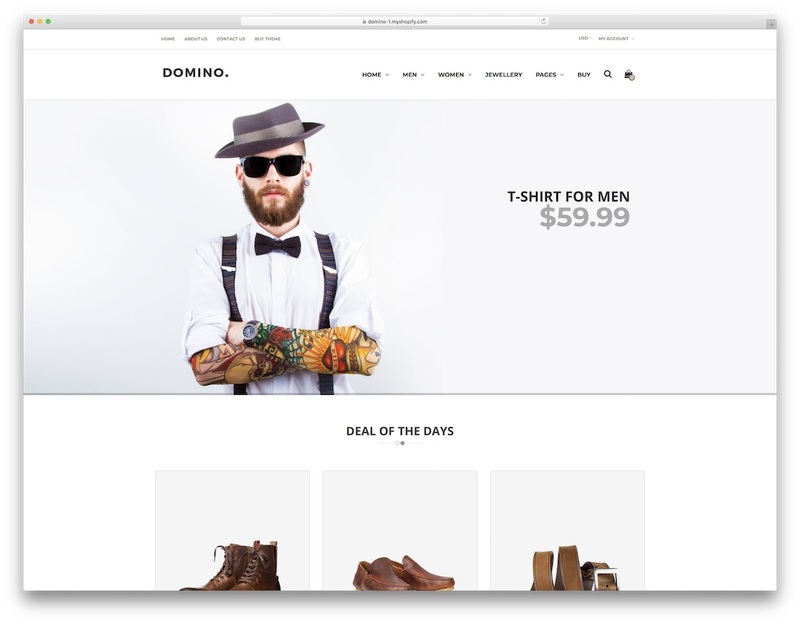 By combining black, white and brown colors, Domino fashion Shopify theme showcases your product in a neat way. You might not yet thought about those colors. However, once you see Domino’s live preview, you will know immediately how well they go together. Still, you might want your website color to follow your logo. If that is the case, feel free to customize the theme to the color of choice. In general fitting all eCommerce websites, Domino is ideally suited for the fashion industry and all of its sub-niches. If the style meets your expectations, you definitely cannot go wrong with this responsive drag and drop Shopify theme. Upon the installation, you can benefit from one of the pre-made layouts and start from there. With Mega Menu, you can create comfortable navigation so visitors won’t be lost on your page. Display which brand you carry with logos slider and show daily deals and featured products with two more practical slideshows. A variety of options helps you customize product page so the shoppers get the most out of it. Cloud zoom effect for pictures with a slider or simple listing is one of them. Customize product details and reviews and add a section for related products. If they are already interested in one product, chances are, they might find the suggested one useful, too. Innovation meets classic design and you get one tool to realize all your needs, Material. The name pretty much speaks for itself. You are equipped with all the features, options and extensions one needs to create that ideal online shopping solution for his project. Without a doubt, you will be able to place everything in order and be ready for the blast off in about 5 minutes. Sometimes, complex final products aren’t so complex to put together. As lucky as you are, Material is a fashion Shopify theme which crafts the unimaginable with exceptional ease. Material follows all the standards and trends regarding design and better customer user experience. Shoppers will have a pleasant time spent browsing your online store and completing orders. From the comfort of their chairs or they are buyers on the go, Material is responsive after all, ensuring perfect adaptation to any screen size. Integrated with Material theme, you get QuickShop, Infinite Scroll, Instagram Feed, 5 Mega Menu styles and various custom internal pages. Supporting social media shares is a must for a fashion shop, too. A cool feature to offer discounts while at the same time attracting a wider audience is the “tweet to get a discount.” A very strategic marketing move that will have your shop spread like wildfire. 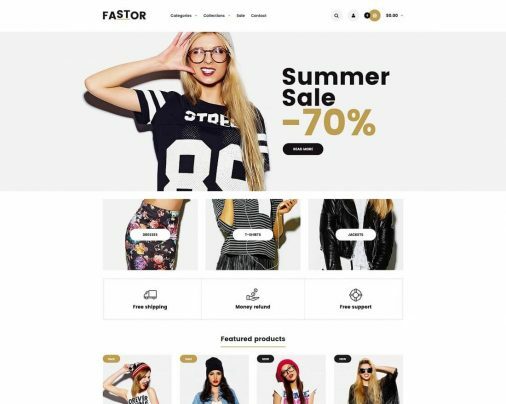 With the new and updated version of Fastor fashion Shopify theme, you get so much more for the same price. Chances are, you might even find the theme on sale. Anyhow, while still leaving the design, the functionality and the performance intact, the theme makes online store building even simpler. Developers eliminated all the clutter, cut out the complex settings and fixed any possible bugs. Plus, for an even better understanding how things are done, all the documentation is in video form. 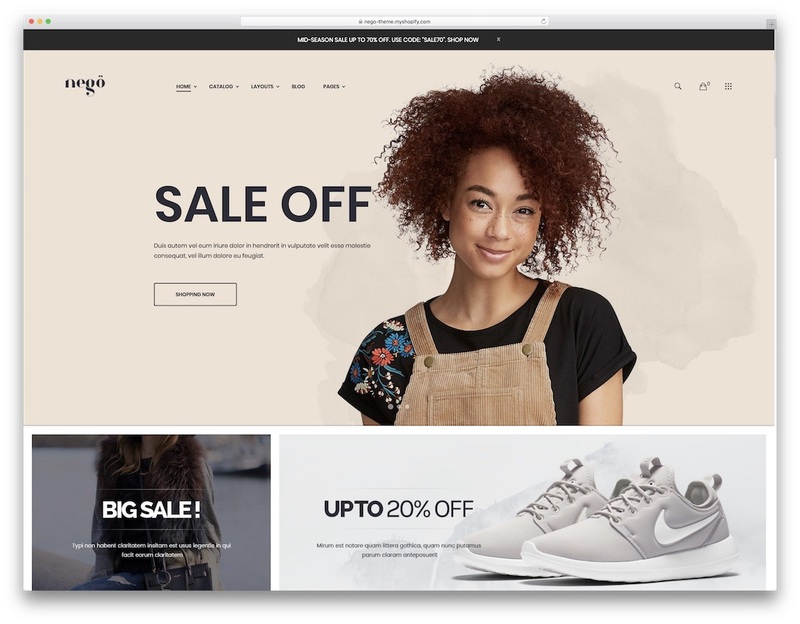 Integrated Shopify Sections give eCommerce business owners more flexibility when it comes to modifying the theme so it transforms into an excellent website. You gotta love the back-end simplicity which gives incredible results on the front-end. Install the theme with just one click, import the demo (I lost count at 59 – yes, there are even more) and then it is up to you and how personalized you want the online store to be. To continue wowing you with numbers, there are also 26 headers available. Pick the one you fancy and change it to your needs. 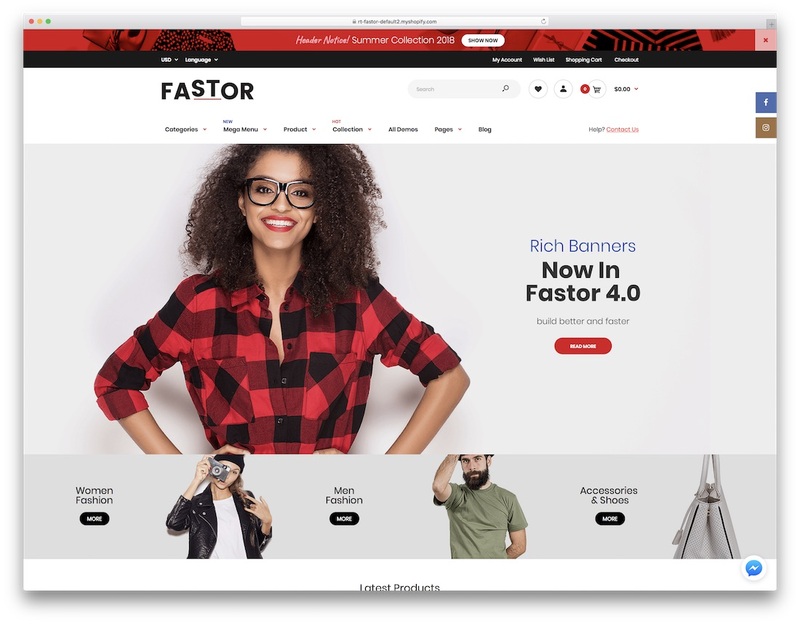 Fastor is a mighty theme with a great potential to help you develop your store in literally just a few clicks. You also save time and money which many consider essential. Like it would have something to do with Quake, just that it has nothing to do with Quake at all. Instead, Qrack is a stylish, modern and extensible fashion Shopify store. To avoid weeks if not months spent building and designing the ultimate online selling machine, pick a premium theme. You have nearly as many different features and possibilities as you need to craft a true masterpiece. You will be impressed by the fact that you have complete control over the layout. In other words, you can modify every block, as well as enabling and disabling it in the admin. From top bar to footer links and everything in between, you can customize every section of the theme to match your desires. Never limit yourself with any of the Shopify fashion themes we have introduced you to with this best collection. These have the power to create any type of e-store. The main slider helps you grab visitors’ attention with magnificent images, texts and videos. Logo placements are left and center and from the top bar, you can also let browsers pick the preferred currency. For more social engagement, Instagram and Twitter widgets will do their thing. Let them do the (free) marketing for you. Nope, Seiko is not that thing wrapped around your wrist that tells you time. We are going to talk about something else. A complete solution for eCommerce entrepreneurs. To get even more specific, a fashion Shopify theme which turns you into a real wizard when it comes to online store development. At first glance, it sounds a daunting task, but you will soon see how noncomplex it all is. 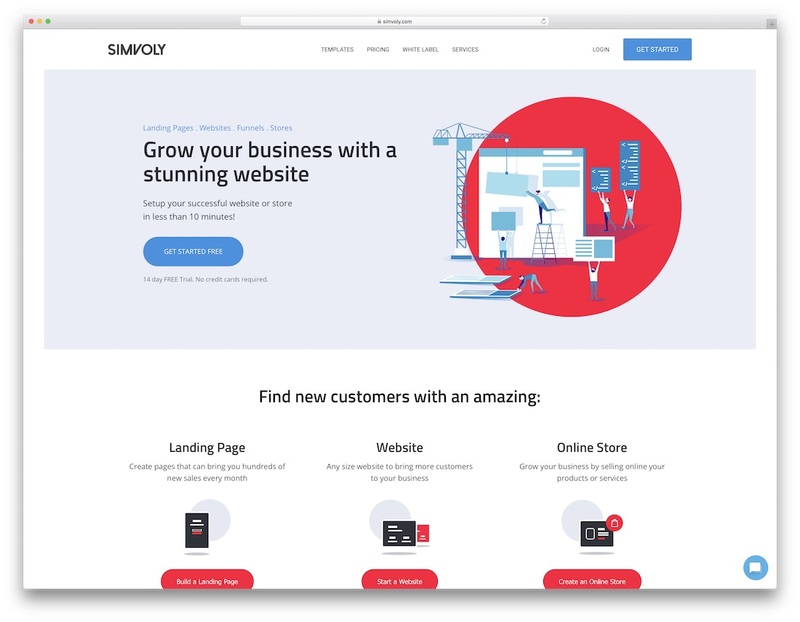 By aiming to create a whole new approach to Shopify themes, Seiko truly brings something special to the online store building process. Not only does Seiko theme come with many demo data which you can use right off the bat, you can also restyle it to your needs. It, too, has an integrated blog section which you can use for promotional purposes. Market your business organically with interesting articles that will attract new potential customers. Provide filters for a more detailed search and have color swatches ready for quick color pick. With a multi level navigation, you ensure everyone who comes across your store to get to find what they are looking for in as little clicks as possible. Create great UX for mobile and desktop users and turn them into shoppers with the first visit. With a theme name like that, I could just leave it all blank in the review section and let you jump straight to the product page. This will not happen since the theme is too good to not write about it. Another great product in the fashion Shopify themes collection that will feed all your eCommerce entrepreneurial needs. With a small investment, you can easily compete with the big guys. As you might be familiar with, many online store behemoths are using Shopify so there is no reason why you should not have a fruitful and lucrative online fashion business, too. Updated with new layout designs on a regular basis, Fashion theme is always following web design, fashion and marketing trends. With a great UX, you can comfortably achieve a ton of stuff. You can grow organically with great SEO friendliness, as well as complete site responsiveness. The latter is also very important when you plan to grow SE rankings and grow organic traffic. In this day and age, if the website is not mobile friendly, it will get pushed back. In other words, no one will ever again see your site in search results. Luckily, Fashion is stacked with essentials and will not disappoint performance. A very pretty clothing and fashion Shopify themes you have to share here.I like Domino theme very much.Keep up the great writing. Wow these themes are very good to make a better personality. Specially I like most “Journey Casual” and “Chrono Dial” .